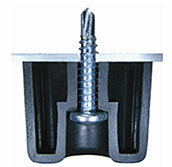 Our Miscellaneous bumpers can be molded from various types of material. 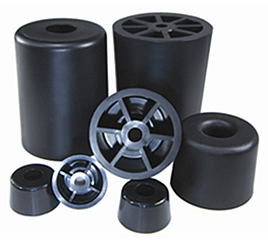 When molded from Thermoplastic Rubber they provide good traction and excellent shock absorbing qualities; unlike natural rubber Thermoplastic has good non-marking qualities and outstanding resistance to stress cracking. 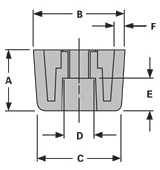 A Trivalent Chromate plated steel Support Bushing (S/B) absorbs the total fastener load allowing the foot to be mounted using a variety of screws or rivets without causing distortion to the foot itself. Excellent resistance to ozone, aging and most chemicals. Available in any color on special order. 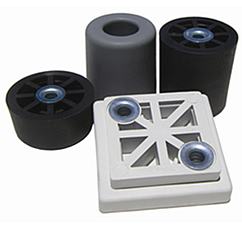 In addition, most of our Miscellaneous sizes are also available in Polyethylene or Polypropylene as an alternative to Thermoplastic Rubber. Recommended where resistance to sliding and shock absorbing or other rubber like qualities are not a requirement. Stock Material: Contact our sales staff for specific sizes that are available in Santoprene Thermoplastic Rubber, Polyethylene & Polypropylene. Weight Capacity: Conclusive determination should be based on individual product testing and evaluation on a case by case basis by the end user. Factors such as; Durometer; the total number of feet (bumpers) being used; the environment (i.e. exposure to ozone, chemicals, extreme temperatures), static vs. dynamic applications, abrasion and shock should be considered and not limited to, for your final assessment.